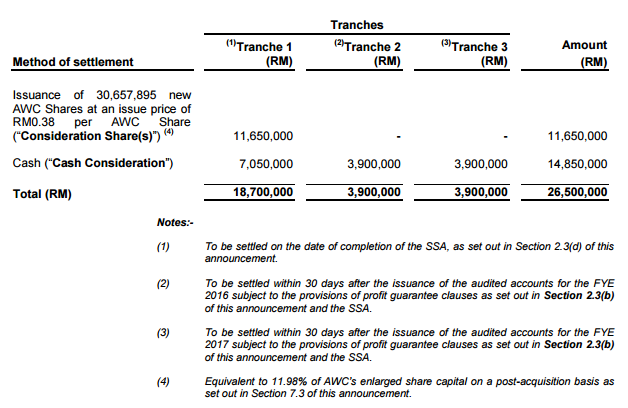 Just a fortnight ago, AWC berhad made an announcement to propose to acquire QudoTech and DD Techniche for RM26.5 mil by combination of cash and issuance of 30.66 mils new shares at a issue price of RM0.38 worth RM11.65 million. The vendors made a profit guarantee of combined RM3.9 mils profit after taxed for each of the next 2 financial years. In case there is any shortfall between the PAT of the target companies and the profit guarantee, the payment to the vendors will be reduced by the same amount of shortfall. 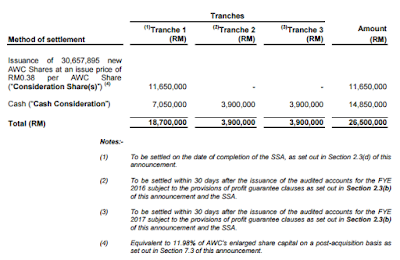 The group will issue 30.65 millions new shares which is equivalent to 13.6% of existing share capital at a issue price of RM0.38 to raise RM11.6 million while the rest of acquisition cost comes from internal cash and the payment is made in 3 phrases. The first RM7 million is the down payment while the second and third payment only need to be paid upon confirmation that the profit guarantee is met at the end of the respective financial years. Based on the profit guarantee, PE will be around RM26.5/RM3.9 = 6.79. Unfortunately, the acquisition announcement did not show much details on the 3 financial statements of the 2 target companies, so EBIT/EV could not be measured. Qudotech involved in M&E engineering works, specifically in all manners of plumbing works and currently has RM66 million order book on hands. Revenue was increasing for the past 3 years. What's more with increasing profit margin with the latest half year result record at 12% net profit margin, up from 7% in FY2012. ROE was more than 30% too with minimal borrowings and gearing. DDT is involved in contracting for mechanical works, piping and systems design for rainwater harvesting products and trading of specialized water tanks. DDT is considered as a new start up company. The company just incorporated in 2012. Net profit was increasing too with expected closed to RM1 million net profit would be recorded in the latest financial year ended June 2015. DDT stands to benefit from the regulatory to make rainwater harvesting systems a mandatory part of building plans for commercial and industrial buildings with a roof area equal to or exceeding 100 square meter in Perak, Selangor, Johor, Melaka, Kelantan and Perlis. So, I think it's not that hard for the 2 target companies to meet the profit guarantee of RM3.9 million. There is a proforma shown based on the profit guarantee added on top of the net profit attributed to the shareholders at FY2014 and divided by the enlarged no. of outstanding shares, EPS is 4.24 cents. Based on the share price now, the valuation may not cheap. Worst case, the EPS will be diluted due to the ESOS implementation. And historical record showed that the group's existing business is not so stable especially the engineering division. Margin of safety is not there. Will only look at it again when the price is right or the group's fundamental improves. PJDev: Another plan in the making?